Something has been weighing heavy on my heart for years now. 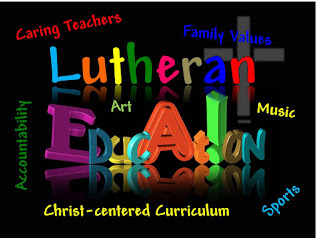 I've posted about Lutheran schools before. Many of them are struggling, so I posted 10 Survival Tips for Struggling Lutheran Schools. I've posted on the philosophy of Lutheran schools and how things need to change. I've posted on Lutheran school excellence and how it has an effect on enrollment. And I've posted on how Lutheran schools need to be ready for the changes happening in our country right now and how they might be an opportunity. As I watch schools that I respect struggle and close, I cannot give up and need to post on this one more time just in case one school or somebody connected to one school reads it and changes in time to save it from closure or foreclosure. You've heard it said regarding relationships many times, money won't fix your money problems. I believe that's true of churches and schools as well. When Lutheran schools start struggling financially, they ask for donations from their congregation(s). "We need more money." Because we, as a church, value our schools, we give it, usually without question. "The school is in trouble and we need to help." Yes, we do, but without question? Without investigating why they are in financial trouble in the first place? If we give them money now, will they be back to ask for more next year? Money won't fix your money problems. Why not? Because money is not your problem. Money is the bandaid used to cover up your problem(s). Giving money to a school that can't meet its budget doesn't fix the problem. Again, they will only be back in a year or two for more money. FIX THE PROBLEMS! I know people disagree with this, but, at some level we have to start thinking of our schools as a business. Yes, they are also a ministry, but they need to be run as a business. They cannot be spending more than they take in year after year until it's finally too late. They cannot be borrowing every year to pay off their debt while continuing to be unable to meet their budget every year. If that's the only answer your board of directors can come up with, you need to talk to someone else. You also have to be ready and willing to change and prepare your parents for change! I have seen too many schools that are simply unwilling to look at their school from a different perspective and FIX THEIR PROBLEMS! What might the problems be? Low enrollment. How are you going to get more students? Look at the 10 Survival Tips for Struggling Lutheran Schools above. Too many scholarship students. It would be fantastic if we could let all students attend for free, but that is not realistic. Set a limit of scholarship students you can take and start a waiting list. Seriously, friends. We cannot just shake our heads and feel sorry that this is happening. We cannot just throw money at struggling schools without analyzing and addressing the real reasons they are closing. FIX THEIR PROBLEMS! Parents who aren't Lutheran don't choose schools because they're Lutheran. Many don't choose them because they are Christian. They choose them because they're good schools academically. They know their children will get an excellent education and will be safe and nurtured. What a mission!! Some churches aren't sure what to do about children in church. Of course, you want them there. There's no need to send them out to be entertained while adults worship. Families need to worship together, not separately. I've been to some churches that have interesting statements in their bulletins. I've heard some pastors make announcements at the beginning of the service. One pastor said he wanted kids to feel comfortable and didn't mind them running around during the service. Whoa! I want them comfortable too, but kids running around would be distracting for everyone. We also don't want parents to feel their kids need to be still and silent. Church can be a challenge for parents with young children. While visiting my parents I read the message below in their bulletin and thought it was the best message I've read so far. First, please relax and enjoy your time here. We know that children tend to wiggle and squawk a bit, so please don't feel embarrassed by it. Your children are welcome here at Faith. Each Sunday your child may pick up a pew activity pouch to the left of the sanctuary doors. Please return these after the service. To make things a bit easier for your family, dare to sit closer to the front where your child can see what's going on at the altar. Guide them in the liturgy and be models for them. Help them find the hymns and encourage them to stand/sit when appropriate, say "Amen" and "Thanks be to God," and generally help them be a part of the service. The liturgy belongs to them too. If you have to leave, hurry back! Jesus wants the children here and we do too. If you need help, just ask. There are many here who are willing to lend you a hand. Below is the visitor message from the same church. This pastor has a very relaxed way about him and it shows in how the people of the congregation interact with each other and visitors. We are pleased that you join us today! We pray that you would be nourished and strengthened as God comes to us in His holy Word. You are among fellow sinners who are in need of God's grace and forgiveness in Jesus. If you would like to learn more about our confession of faith or desire pastoral care in any way, please contact Pastor _____. If you really like the message in your church bulletin, please share it in a comment!